Ever wonder just why no two snowflakes are alike? Read on! A snowflake is simply a bunch of ice crystals stuck together. Each crystal started as a speck, perhaps a particle of volcanic ash or evaporated ocean salt or even a grain of pollen. As the speck cooled high up in the atmosphere, water vapor stuck to it. Tossed about in the cold air, the speck collects more water vapor, grows bigger and heavier, and begins to fall to earth. 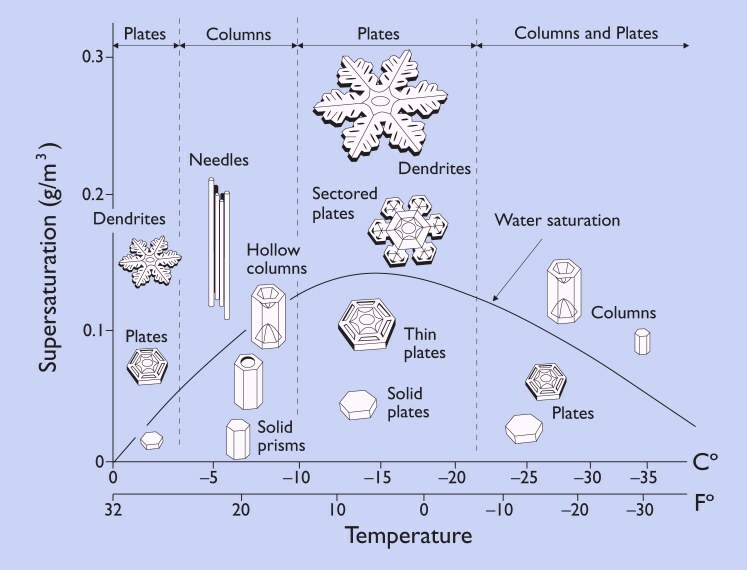 The shape of a snow crystal depends on how wet and cold the air is where the crystal forms. As the crystal falls through the air, its shape and size may change as conditions change. Crystals may collide, clump together, and break apart. Breathe on that snow crystal on your mitten and it will change again, melt, and disappear. The journey each snowflake takes, falling through rapidly changing conditions, makes it unlikely that any two snowflakes will be exactly alike. What types of snow crystals are you likely to see? Crystals shaped like columns, needles, and hexagonal plates generally form under low temperatures, little moisture, and grow slowly. Complex crystals—the beautiful star-shaped crystals we think of as the traditional snowflake—form under higher temperatures and humidity. The type of snow crystal that falls will often determine whether a snowfall is sticky, slippery, powdery, or good for snow building. Wilson Bentley, born in 1865 in Jericho, Vermont, devoted his entire life to studying and photographing snowflakes. 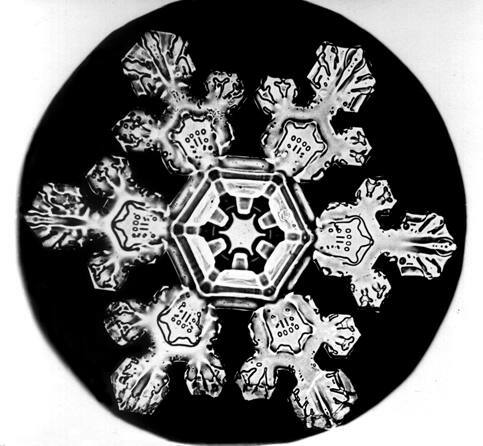 His gorgeous photos, first published in 1931, are still studied by scientists and available to the public in Snow Crystals reprinted by Dover Publications. Bentley’s contributions are immortalized in a museum and monument in Jericho and in a lovely children’s book, Snowflake Bentley, by Jacqueline Briggs Martin. First, locate a dark surface. Simple household objects—a black scarf, a piece of black construction paper, or a dark baking tray—work fine. Next, take your dark surface outside, cool it to air temperature, and then hold it out flat to catch some falling snowflakes. Take a look at what you capture, but be careful not to breathe on the flakes or they will melt and disappear. A magnifier will bring out the details. 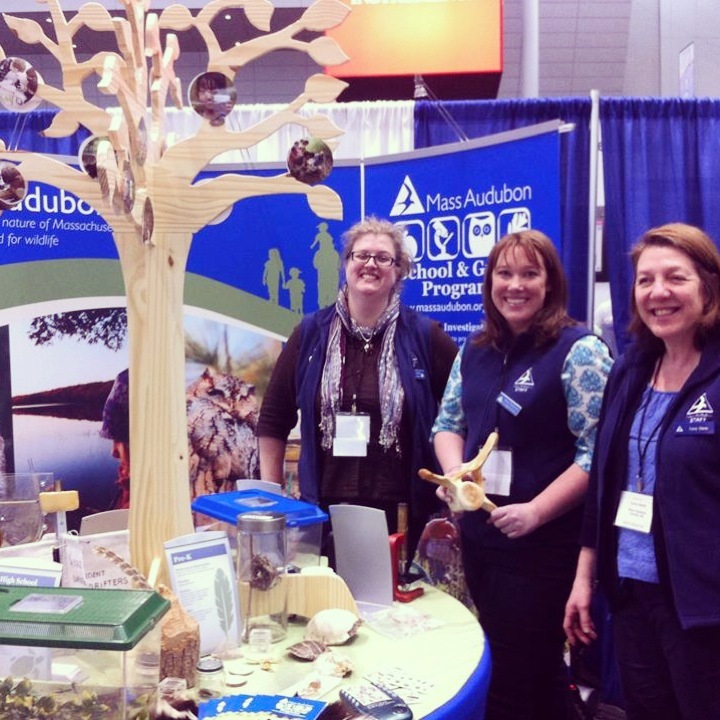 Enjoy and learn more about snow during a Mass Audubon program this winter. And please stay safe during the storm! This entry was posted in Nature Notes and tagged science, snow, snowflake on February 7, 2013 by Kristin. By now, we’re well into foliage season, and many of us have likely done some leaf peeping, as it is shaping up to be a year of spectacular colors (see Foliage Forecast below for why). When you’re checking out nature’s painterly display, do you ever wonder why the leaves change color in the fall? Chlorophyll. Needed by trees to convert sunlight into food (known as photosynthesis), chlorophyll also provides the green hue to leaves. Carotenoids. The same thing that gives bananas and sweet potatoes their yellow and orange hues makes leaves golden as well. Anthocyanins. This one is responsible for the vibrant red and purple tones in leaves as well as raspberries and eggplants. Since daylight hours are longest during the summer, an abundance of light is available to trees. This means they’re performing photosynthesis optimally and ultimately, storing energy as carbohydrates. The result: lots of chlorophyll, and gorgeous, bright green leaves we see in the spring and summer. Carotenoids are in leaves during the growing season as well, but we don’t get to see the colors until the fall since so much chlorophyll is present. 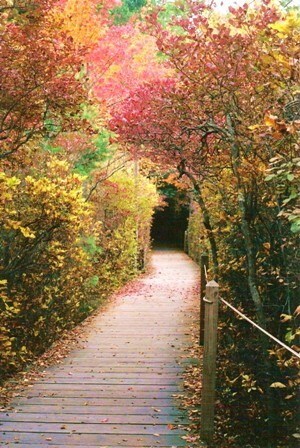 The anthocyanins responsible for fall colors are produced in the leaves only in autumn. As the nights begin to lengthen and our daylight hours decrease, trees begin to prepare for winter, and respond to decreasing sunlight by producing less chlorophyll, and eventually stop photosynthesis to lay dormant through the frozen season. As chlorophyll breaks down, carotenoids are able to show through, creating the vibrant display of yellows, oranges, and browns. The visibility and brightness of the red hues you might see is determined by temperature, soil moisture, and direct sunlight. During warm, sunny fall days, leaves produce lots of glucose, or sugar, but the cool evening temperatures cause gradual closing of the veins in the leaf. This keeps the sugar sap from running down into the tree branches and trunk. More light means more sugar, and the combination of these things spurs the production of anthocyanins in certain trees like maples, which show gorgeous reds, purples, and crimson. The most stunning and varied-hue foliage displays come from a warm, wet spring season, a summer season that is not too hot or dry, and an autumn with warm, sunny days and crisp nights. This year, we have been experiencing exactly that weather pattern, and are predicted to be in for an absolutely gorgeous transition into winter, unless we experience some warmer and wetter than normal weather right about now. If you’d like to learn more, please join us on an upcoming fall foliage program. Happy leaf peeping! This entry was posted in Nature Notes and tagged autumn, fall, foliage, leaves, science on October 11, 2012 by Mass Audubon.